Recent years have seen a strong consumer tendency to seek out everything Eco-friendly . This trend has emerged in the modern space in which we live. In particular, the passive house is becoming a popular way to approach green building in order to create homes that save energy, improve the performance of insulation, and maintain privacy. 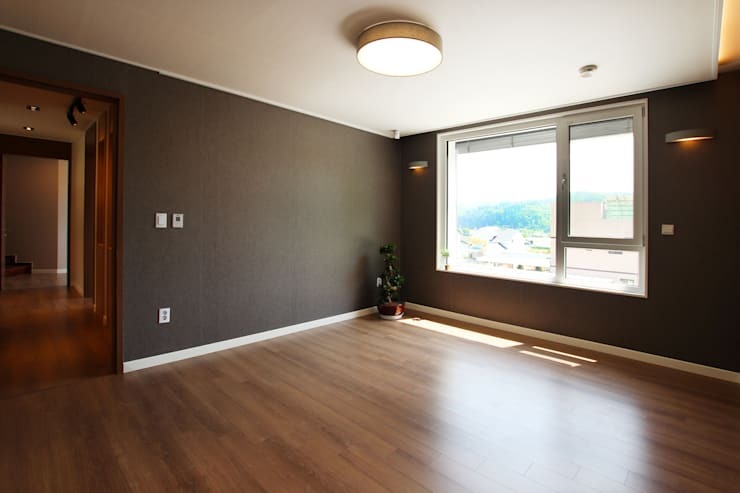 The living space you'll see on this tour in Yongin, Gyeonggi-do has passed the certification test for passive home building and upon its completion of construction. 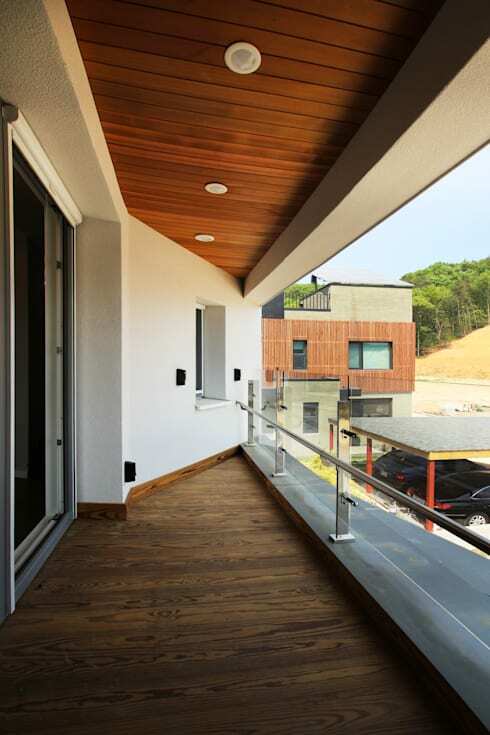 If you want to live in a home and have a great conscience about it, consider living in a passive house – here, we'll explore the details of a passive home in Korea, revealing what makes living in a passive home so great. In order to maintain it's distinction as a passive house, the architects used Ltd. Hanbo engineering patented products and insulation panels of HIP-z (High Insulated Panels). These panels were built as a method to fill the non-insulated areas of a home with thermal insulation. By constructing the wall at the same time as applying these panels, using this construction method provided an opportunity to build a passive house with reasonable building costs. Now, you'll go into the interior of the nicknamed Passive House PR model home, which boasts a clean, beautiful appearance in addition to the great outdoor views it affords. Entering inside, you first meet the living room. The living room has floor-to-ceiling windows leading to the terrace outside. The use of passive systems such as high insulation windows and doors of 88mm PVC windows (Ug = 0.70 W / m2K or less), in addition to a state-of-the-art heat recovery ventilation system, one can feel right at home in this high-performance, highly comfortable space. In addition, a double overlap in the ceiling's design has been neatly constructed, bringing subtle natural lighting to the room. In this view, you can observe the living room as well as the kitchen and dining area. 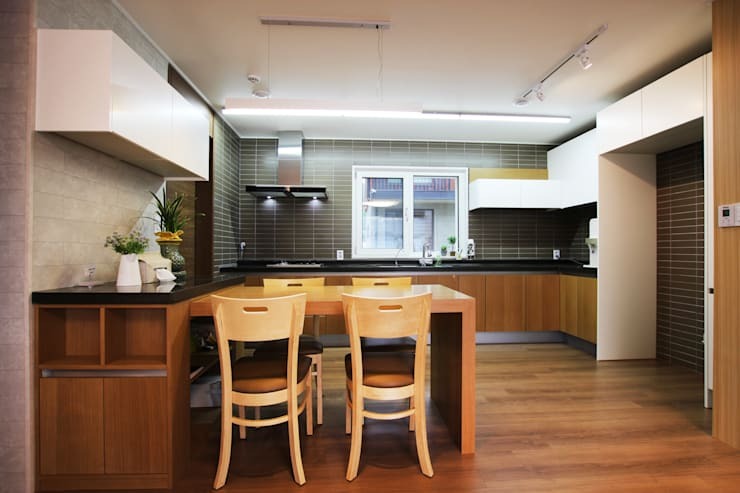 Passive houses are the center point between the manmade and the natural, so the selection of eco-friendly materials in the kitchen and dining room is ideal. Because of the natural material present here, a warm and stable atmosphere has been instilled in these familiar central rooms. With ample storage space for keeping things neat and an open, free-flowing design, this family can circulate unnumbered throughout these open areas. 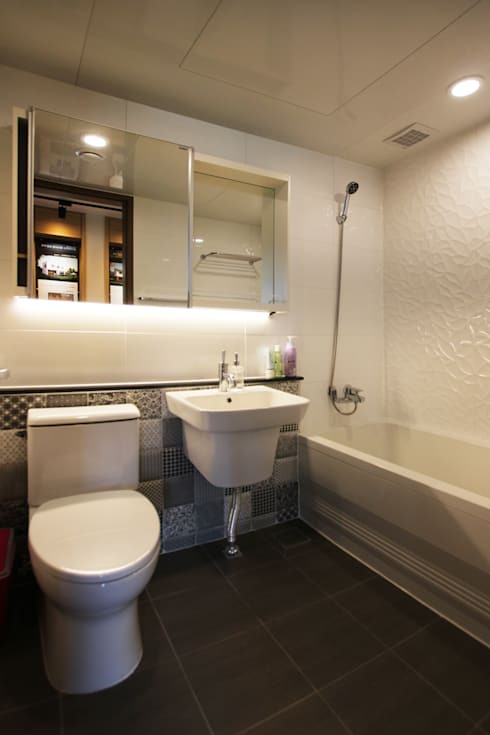 The bathroom here is nowhere near too big and flashy – while there are style elements here, most of the room is convenient and practical. The state-of-the-art ventilation system allows you to easily reduce the moisture in the air after a shower. The well-insulated interior rooms saves energy while enjoying the privacy of the solid insulation (while the air ventilation prevents mildew from gathering). The top of the cabinet and the washbasin was designed to make the small bathroom feel larger than it is by covering the cabinet with a mirror that adds depth to the room. Overall, the space is neat and uniform with a highly practical design. It's time to go upstairs! Observing a typical staircase, you'll see that the space reserved for the stairs is often a dark, cold, or unadorned space. 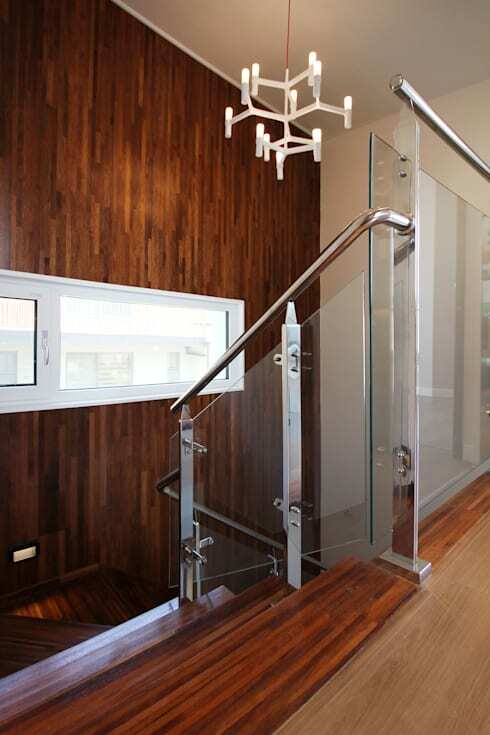 However, in this passive house, the stair hallway isn't dark or cold – far from it! Since the design of the home attempts to accept as much natural light as possible, the space is purposefully illuminated – even the staircase – so that it will require minimal artificial lighting. People spend a lot of time in the living room area, so the comfort level in these living spaces needs to be at its prime. 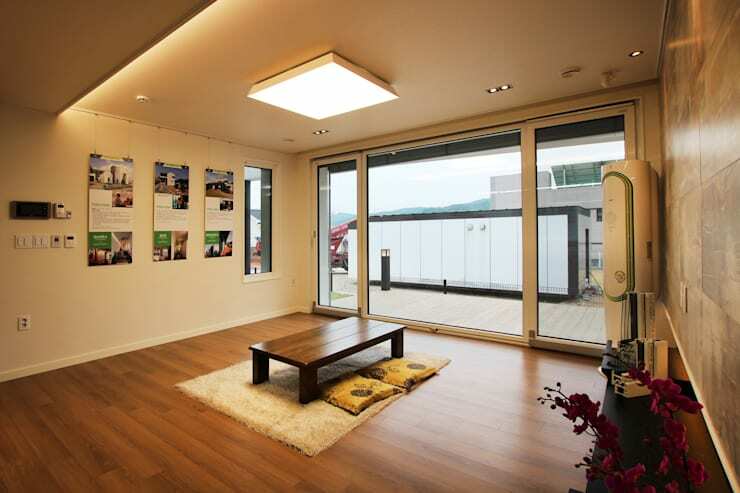 This passive house's living room is positioned to face the South to gather maximum sunlight in the winter. In the summer, a typical home would then have the slight disadvantage of heating up a bit too much during hot summer months; however a passive house is designed with materials that prevent the interior air from getting hot. First, there's a long awning constructed outside the window that shelters the sun at its highest point. In addition, thick adjustable blinds have been added to the outside for blocking sun. This exterior feature makes for a neat, hassle free appearance on the inside and encourages free airflow throughout the room. The second floor features a lovely terrace leading to the outside. Heating or cooling efficiency is significantly higher because it came from the outside through the terrace. The terrace of the second floor offers a clean and modern design with a its polished glass balustrade, while the floor and ceiling instill a warm atmosphere with the natural textures of wood. 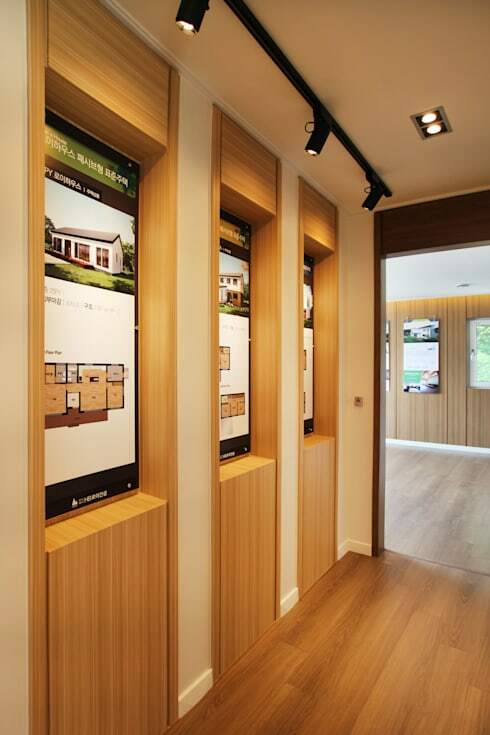 Advertisements in the model home's hall show how this home has to meet with a detailed set of descriptors in order to be granted certification as a passive house. These requirements focus on the materials, design, and methods used to construct the home, all focusing on creating a passive house with excellent thermal insulation, in which you can spend the winter using minimal heating equipment. The home's not just efficient in the winter – in the summer, the home's design can help keep cool in and hot out, reducing the energy spent on air conditioning, reducing anywhere between 60 to 80 percent of the home's energy use. For more passive home inspiration, here's another tour of a passively heated home! What do you think of this green home? Comment below!